I know. Two weeks ago, it was looking like there was going to be a rocket launch every night in the week, but weather had other plans for the TacSat-3 launch at Wallops Island Flight Facility on the coast. They’re 150 miles from here, or so, out near Ocean City, but on a clear beautiful day like today, from any high place, you should be see the contrail of the bright Minotaur rocket going up into space with a couple of satellites. 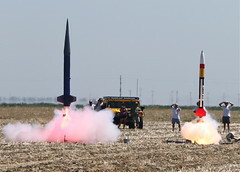 With nary a cloud in the sky, only mechanical difficulties could delay the launch. Here’s hoping the mechanics are all set. Launch is scheduled for 7:35pm, and from DC, look to the East-Southeast. i only think this is cool if the smoke will be pink like in the picture you used.